Another view of P&O Princess Cruises' ROYAL PRINCESS, seen here leaving Greenock after a visit in September 2003. 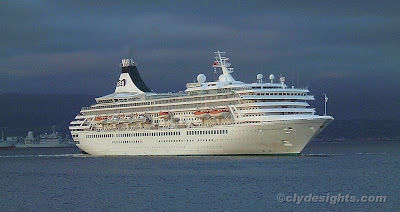 Two years later, she was transferred to P&O Cruises, given their trademark buff funnel, and renamed ARTEMIS. Built in 1984 , her order had been announced two years earlier and was placed with the Wartsila Shipyard at Helsinki as no British shipyard was able to guarantee delivery deadlines at the required price of $150 million. She was named by the late HRH Princess of Wales at Southampton in November 1984 as a mark of the ship's status within the P&O Group.